This Fall, VirtueMart, a progressive and popular e-Commerce solution, reaches a new milestone and celebrates its Birthday! Starting in 2005, it has made a long, thorny yet successful way full of challenges, brutal competition, improvements, and excellent service. Could we, Cart2Cart Team, stand aside this happy event? Definitely not! 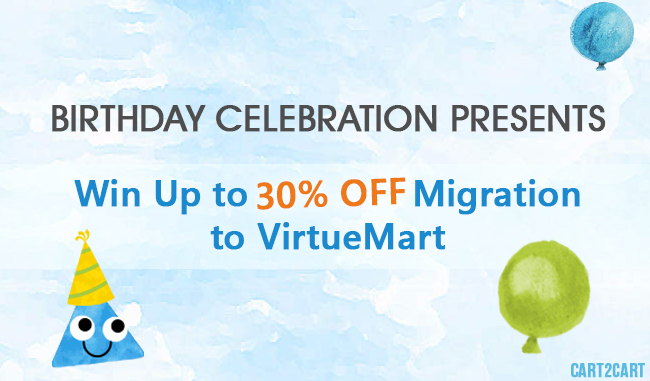 Thus, on occasion of VirtueMart birthday celebration, we offer you to win up to 30% OFF automated migration to VirtueMart from any supported platform! All you need to do is to choose one of the presents and hope for luck! And believe us, there is no chances you’ll lose! Years of experience on a volatile market of e-Commerce solutions is the best guarantee of platform’s quality. VirtueMart now powers nearly 90 000 online shops worldwide and demonstrates a positive growth tendency. So, why wouldn’t you join an extensive community of successful VirtueMart store owners with a considerable discount? Pick one of the present boxes and win a coupon code with up to 30% off migration to VirtueMart! Hurry up, our special offer is valid till the 18th of September only! P.S. Already using VirtueMart? Our coupon code can be applied to VirtueMart upgrade too!